Visit top attractions by day and see dazzling installations by night with our two-day Lumiere London guide. Start the day with a hearty breakfast in King’s Cross. Savour British classics such as a full English, or haggis with duck egg at Plum + Spilt Milk, tuck into Australian-style fare at Granger & Co, or warm up with a signature chai and bacon naan roll at Indian street food hotspot Dishoom. It’s now time to get your culture fix. Firstly, head to the House of Illustration (open from 10am) where you’ll find exhibitions on two of the UK’s top sketchers: Roald Dahl’s illustrator, Quentin Blake, and political cartoonist Gerald Scarfe. Then, wander through Bloomsbury’s pretty streets and squares to the British Museum, which is a treasure trove of exhibits, including temporary shows covering everything from gods to printmaking. All that cultural immersion will have you feeling like a much-needed rest, so stay at the British Museum for lunch. Dine on seasonal British favourites under the glistening roof of the museum’s Great Court at The Great Court Restaurant, opt for light bites such as freshly made sandwiches at the Court Café, or choose from the many pizzas on offer at The Pizzeria. Revitalised, hotfoot it to London’s West End, one of the key areas for Lumiere London 2018. It’s a great time of the year to visit shopping hotspots Oxford Street, Bond Street and Regent Street, as the January sales are in full swing. Browse the shops for bargains, with top department stores Selfridges & Co, John Lewis and Liberty offering a range of fashion, homewares and food items. You’ll see some of London’s most iconic lights along the way, including the big screen at Piccadilly Circus, made from more than 11 million bulbs! 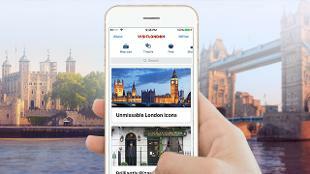 Other nearby sights include Buckingham Palace, Trafalgar Square and Chinatown London’s ornate gates. If you’re still peckish, make use of a special Lumiere London offer to enjoy a free glass of champagne with afternoon tea at Fortnum & Mason, tuck into a traditional afternoon tea at Scoff & Banter Tea Rooms, Oxford Street, a Diptyque-inspired alternative at Hotel Café Royal London; or simply enjoy a warming drink and cake at coffee gurus, Coffee Island. As night falls, it’s time to visit Lumiere London’s many installations in London's West End from 5.30pm. Once you’ve been wowed by the dazzling works, reward yourself with a meal at one of the area’s many restaurants. Scottish-themed Boisdale specialises in game and steaks; Cinnamon Soho offers flavour-packed modern Indian dishes; Trader Vic’s brings a taste of Polynesia to central London; while May Fair Kitchen is offering a complimentary cocktail with its special deal for Lumiere London. Head back to King’s Cross on the Piccadilly line from Green Park, Piccadilly Circus or Leicester Square Tube stations for a nightcap. Try the Golden Arrow for whisky and wines, modern pub The Lighterman for beers and wines, or pair a small plate with a cocktail by making use of Spiritland's Lumiere London offer. If you’re at King’s Cross by 10.30pm, you’ll be in time to spot some of the Lumiere London artworks before they’re switched off! Start the day in Fitzrovia, a relatively tranquil neighbourhood just north of Oxford Street. The Riding House Café’s legendary breakfasts feature juices, mueslis, pancakes and more; Honey & Co. wakes you up with Middle Eastern flavours; and Berners Tavern ticks all the boxes for a picture-perfect spot with its unique decor and expertly crafted dishes. 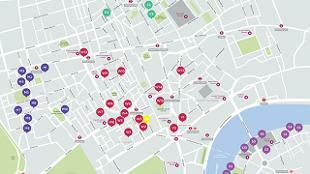 Cross Oxford Street and head to Covent Garden, home to an elegant Piazza and its famous market. Stop to watch the expert street performers, from mimes and jugglers to classical musicians, before wandering around the market’s shops and artisan stalls. After your shopping spree, learn about the history of London buses, Tube and more at the London Transport Museum, or venture to nearby Somerset House – make sure not to miss the special exhibition on Parisian portraitist, Chaïm Soutine, at The Courtauld Gallery. Venture across the river and arrive at the South Bank in time for lunch. There are many options here, from flatbread pizzas at quirky Topolski, to dim sum at Ping Pong, or Latin bites at Las Iguanas and Wahaca. If you’re here at the weekend, the Southbank Centre hosts a market packed full of street food spanning cuisines from across the globe. London’s South Bank boasts stunning views of some of the city’s most iconic sights. See most of them with a flight on the Coca-Cola London Eye – the famous wheel takes 30 minutes to rotate fully, giving you ample time to spot the likes of Big Ben, Houses of Parliament, St Paul’s Cathedral and also Westminster Abbey, which is open until 9pm (last admission 8pm) on 18 and 19 January with half-price entry from 6.30pm. Alternatively, take a river boat tour with City Cruises or Thames River Services, both of which are offering money off during Lumiere London with special offers. If you’re a music fan, take time to explore the ABBA exhibition at the Southbank Centre, aptly located near Waterloo – the title of one of the Swedish band’s hit songs! The entertainment venue has plenty of options for a quick snack or drink, including cocktails and wines at riverside spot, Skylon. 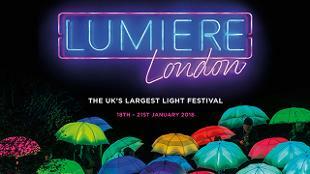 You’ll find many of Lumiere London’s installations along the South Bank and in nearby Waterloo. Take your time to see them all from 5.30pm, first exploring those along the river on the South Bank, before heading south towards Waterloo. Having spotted each of the works, visit The Cut for dinner. You have a great choice of places to eat here: gastropub The Anchor + Hope is perfect for modern British dishes, Auberge specialises in French brasserie-style plates, Baltic serves up Eastern European specials, while Meson Don Felipe combines Spanish tapas with a friendly ambience. End your night with magnificent views from the Waterloo Sky Bar or the OXO Tower Bar with a cocktail in hand, where London’s skyline itself becomes a show of twinkling lights. Other options include Bar Elba, which is offering 2-for-1 on cocktails between 5.30pm and 9.30pm during Lumiere London. If you’re here for longer, check out our three- and four-day Lumiere London itineraries, or follow our family and one-day itineraries for more inspiration.